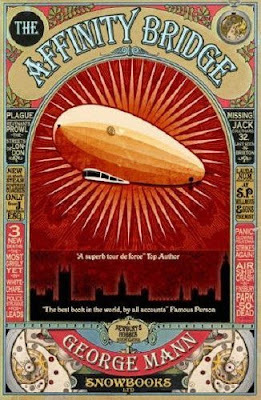 SETTING: Welcome to an alternate version of London, year 1901, where airships roam the sky, mechanical cabs are starting to displace the horses and coaches, automatons are starting to replace servants and even pilots, and Queen Victoria is going as strong as ever as a part mechanical, part human ruler in the care of strange Dr. Fabian. But there are downsides too, like a nasty plague that rots the brain transforming people into mindless zombies before killing them; poverty and slums; and a society that is essentially patriarchal though it allows limited scope for women. The occult, magical elements hover in the background, with the sfnal mostly in the forefront, so “The Affinity Bridge” is more or less a science fantasy novel that should appeal to lovers of both genres. “The Affinity Bridge” is available through independent UK publisher Snowbooks in three different versions: a Library Hardback Binding (July 1, 2008), a Paperback (September 1, 2008), and a glorious Slipcased Limited Edition, signed by the author, numbered out of 500, and includes a specially minted bronze coin. A US version of “The Affinity Bridge” will be published by Tor in 2009 I believe. "The Affinity Bridge's" cover was done by Emma Barnes, the Managing Director and co-founder of Snowbooks. “The Affinity Bridge” is very easy to read and I felt very comfortable in its milieu while marveling at the inventiveness and wondering what new stuff the author would introduce. Character-wise, Maurice Newbury is an engaging cross between Sherlock Holmes—occult dabbling, opium habit, etc.—and James Bond. Like Bond, the Crown Investigator deals with affairs of state, uses gadgets, attends secret meetings, has a Mr. Q-like “Fixer”, and gets into plenty of hand-to-hand fights with villains and hair-raising escapes. The only real difference is the lack of women because of the Victorian era. The true star of the book though is the plucky, sensible, “regular middle class girl” Veronica who likes to challenge the still mostly patriarchal society as an assistant Crown Investigator participating at “ugly crime scenes unsuitable for a lady” and so on, but at the same time years for “simpler” times, when there were not so many machines, contraptions and such. Basically, Veronica provides a sharp contrast to Maurice who is an “early adopter” of technology and loves the new modern “toys” however imperfect they have been so far. The stodgy older Sir Charles meanwhile, has some surprises not quite up his sleeve, but close so to speak, and the trio's interactions work extremely well. Then there are the Amelia seizures/prophecies scenes which are also show stoppers and I hope to see her free of the asylum and part of the team in the next installments. I can't wait to sink my teeth into this book....The cover is so appetizing, and along with your recommendation - how could one possibly deny themselves the pleasure of this book. Check this review that has two small paragraphs from the book. I do not remember for sure if I read a bigger excerpt, but I know that the book sounded so good that I ordered the hc edition from Book Depository in mid August, with the mmpb coming out September 1 - and available now at less than half the price I paid - and I do not regret it since I read the book on my vacation at the end of August. I took it with me to read when I waited in line at tickets at Boston's Aquarium and at some stores there later and lots of people eyed the beautiful cover. Oh that's what it's about! Thanks for the review. I like the idea of this one! Loved this book and can't wait to read the others in this series.